iTunes Ripper M4P to MP3 converter is a powerful iTunes/Apple Music M4P converter for you to easily remove iTunes DRM and convert Apple Music M4P songs, iTunes M4P songs, iTunes M4P/M4B/M4A Audiobooks and Audible AA/AAX Audiobooks to MP3, M4A, AAC, etc. to play on any computer and mobile device. This iTunes Ripper and Apple Music Ripper automatically loads your iTunes library and convert all songs/Audiobook to DRM free MP3, M4A, AC3, AAC, AIFF, AU, FLAC, M4R(iPhone ringtone), MKA. 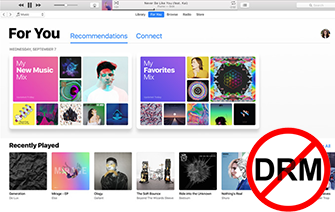 Easily convert DRM-protected M4P songs purchased from iTunes store before 2009 to MP3/M4A, etc. Convert Apple Music M4P songs to MP3, M4A, etc. No need to download Apple Music songs to your Mac/Windows. Convert iTunes M4P/M4B and Audible AA/AAX to MP3, M4A, etc. Chapter preserved in M4A output. Convert iTunes/Apple music M4P files and preserve ID3 tags artist, album, genre, artwork etc. to output MP3 and M4A files. Convert iTunes/Apple Music M4P to MP3 at up to 16X speed. Or adjust conversion speed from 1X to 16X according to your need. 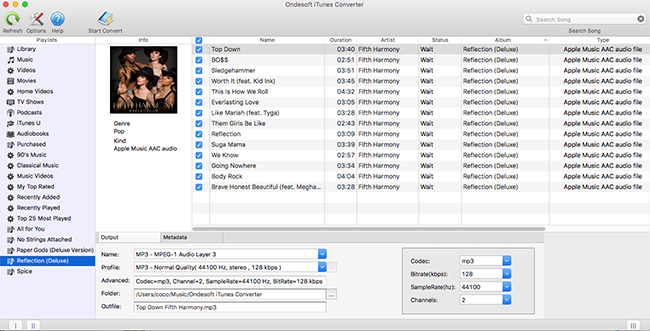 Batch convert all tracks in your iTunes library. Or sort them by playlist, album, artist, type, etc. M4P to MP3 converter provides different quality settings for each output format. You can also customize audio codec, bitrate, samplerate and channels. Set name format for output song with Title, Artist, Album, TrackID, DiskID and characters like "-", "/". The powerful search feature enables you to quickly find the M4P files you want to convert to MP3. iTunes Ripper M4P to MP3 Converter lets you rip the DRM(Digital Right Management) protection from music, movie, TV show, Audiobook, etc. you’ve purchased from iTunes/Apple Music. With this M4P converter, your M4P files can easily get rid of DRM protection and be saved as MP3, M4A, AC3, AAC, AIFF, AU, FLAC, M4R, MKA. You can then transfer these DRM free music files to other computers, smartphones, and tablets with different media players and share with your friends or families. You don't need to import or drag&drop M4P files to this M4P to MP3 converter, since it syncs with your iTunes Library automatically and display all media on the iTunes-alike interface. M4P to MP3 converter preserve artist, album, genre, artwork etc. from M4P protected files to the output MP3, M4A file. iTunes Ripper Mac M4P converter converts M4P files at a speed rate of up to 16X. When removing DRM protection from M4P files with this M4P converter, you can predefine output file name format by yourself. The name can contain title, artist, album, and Track ID. Set the M4P converter Metadata and chapter option to preserve these information to your output M4A or MP3 files. This Mac M4p to MP3 converter provides 3 predefined profiles (Normal quality, high quality and low quality) for each output music format. You can also customize output format profile by changing advanced audio parameters such as bitrate, SampleRate and Channels. 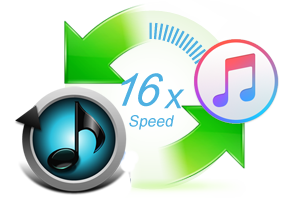 It will not take you much time to convert entire iTunes M4P Music to MP3 with the 16X speed of the M4P converter. M4P to MP3 converter allows you to modify settings such as bitrate, sample rate and channel according to the requirement of your output file. iTunes Ripper M4P converter automatically loads all your iTunes files, including music, movie, TV show, Audiobooks, etc. All you need to do is check songs/Audiobooks you need to remove DRM protection from the intuitive M4P converter interface, choose output format and folder, and click Convert. Soon you will get the DRM free files and enjoy them on any device.